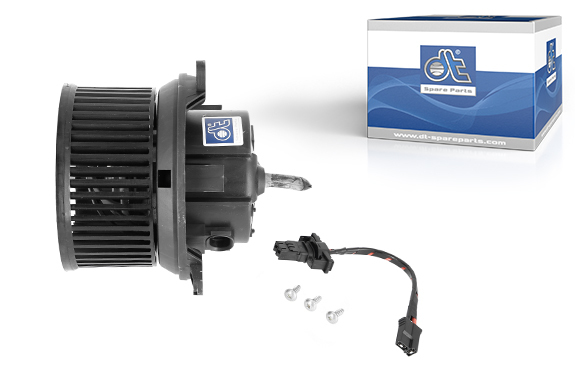 The fan motor 4.68600 is characterised by its high-quality workmanship. The individual components are produced to the newest state of technology and are excellently coordinated with one another. Due to this, the exact installation and optimal air output, noise generation and service life are guaranteed. The fan wheel is manufactured using high-quality plastic and balanced in order to maintain the noise-level low and increase the service life. Before replacing the fan motor, the mounting location must be checked for water / traces of moisture. Fan motors are frequently damaged by penetrating water. The interior filter should be checked and replaced dependent on the findings. A contaminated interior filter can lead to thermal overloading of the fan motor. A tensed obstructed fan motor can malfunction and as a result develop noise. Likewise, the adapter cable must not be laid tensed. Furthermore, it should be ensured that there are no abrasion marks on the electric cable. The condensation drainage should be laid in such a way that potential condensation can run off. During the test run, the rotation direction must coordinate with the arrow indication on the fan wheel. An incorrect rotation direction can mean that the electrical line’s polarity is reversed and the fan would have no power.